Venezuelan opposition leader Juan Guaidó speaks during a rally demanding the resignation of Venezuelan President Nicolas Maduro in Caracas on Monday. 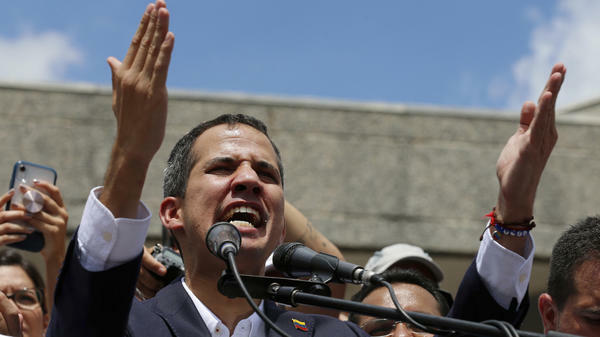 After more than a week abroad trying to build support for his claim to the presidency, Venezuela's opposition leader Juan Guaidó re-entered the country via a flight from Panama City on Monday. He was met at the airport outside Caracas by opposition supporters, members of the opposition-controlled National Assembly and a number of foreign diplomats, including the U.S. chargé d'affaires, Jimmy Story. Agradecemos a los Embajadores de Argentina, Brasil, Canadá, Chile, Perú, Ecuador, EEUU, Alemania, España, Francia, Países Bajos, Portugal y Rumania, quienes acompañaron nuestra llegada a Venezuela en una demostración del firme compromiso del mundo con nuestra democracia. Amid raucous cheers from the crowd, Guaidó headed to a car, waving and giving a V for victory salute, before heading into Caracas for a rally. Guaidó called for demonstrations throughout the country as he continues to pressure President Nicolás Maduro to cede power. 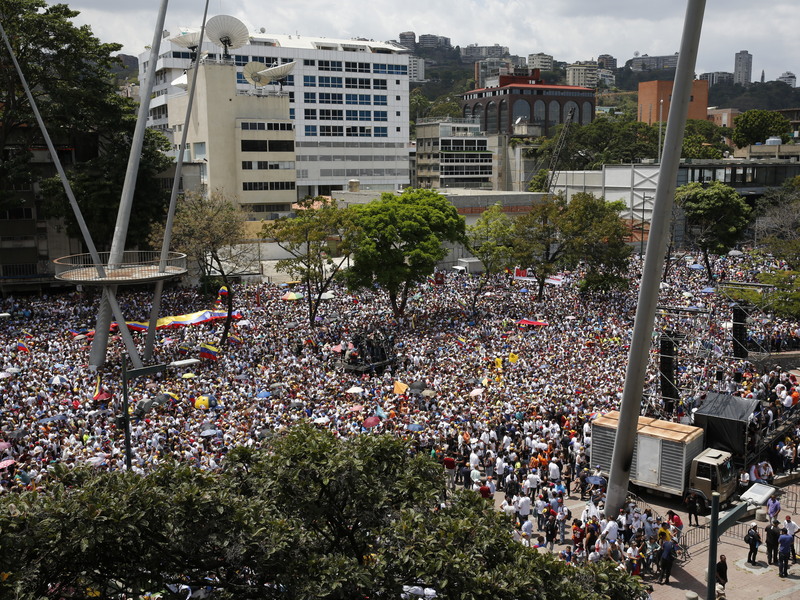 Guaidó addressed thousands of supporters gathered in Caracas Monday, telling them, "We're much stronger than ever." "We are ecstatic," Tita Beaufrand, a Caracas-based photographer and graphic designer told NPR's Philip Reeves at the rally, noting Guaidó's reception at the airport, complete with diplomats, was worthy of "a president." Beaufrand called Guaidó "the right man, at the right time, at the right place," noting she has been protesting in Caracas for around two decades: "I've been shot at, I've had to run, I've had to breathe gas," she said. "There's certainly no going back." Guaidó is asking supporters to maintain the momentum, calling for new country-wide demonstrations on March 9. The 35-year-old Guaidó is the self-declared interim president of Venezuela, and has the support of dozens countries including the United States. Last month, Guaidó secretly left Venezuela for Colombia and has since been on a multi-nation Latin American tour aimed at shoring up support for his claim to Venezuela's presidency. He departed Ecuador on Sunday. Anti-government protesters rally to demand the resignation of Venezuelan President Nicolas Maduro in Caracas on Monday, the same day opposition leader Juan Guaidó returned to the country. His return to Venezuela could precipitate a direct confrontation with Maduro, who will face the choice of whether to arrest Guaidó or whether to let the challenge to his authority continue unimpeded. If the Maduro government does try to arrest him, Guaidó said in a broadcast Sunday night, "it will be the last mistake they make," Reuters reported. If Maduro's forces try to detain him, Guaidó said, he has left a "clear path" for his allies to follow, telling his supporters they are "stronger than ever" and that now is not the time to back down. Voy camino a casa. Regreso a seguir trabajando por nuestra ruta y a fortalecer la presión interna que nos permita liberar a nuestro país. In an interview with The Washington Post on Sunday, Guaidó said he saw multiple scenarios that could lead to the ouster of Maduro without the use of external force. "First, that an election is allowed to take place in a free and transparent manner. That's what we're working for as soon as possible." Also, he said, "there is an option where the military could get on the side of the constitution and of Guaidó and of the resistance, and it could stop the usurpation. That's the option that uses force, but it comes from within." Guaidó told the Post he has offered amnesty guarantees to military and civilians who are part of the Maduro regime and "who are willing to help restore democracy in Venezuela." Hemos venido construyendo entre todos los sectores el #PlanPaís, que es el futuro que soñamos. Tenemos claro lo que hay qué hacer y cómo lo haremos. When he left on a tour of Latin American allies in pursuit of support, Guaidó ignored a travel ban put in place by a Venezuelan court. Experts are uncertain what will happen now that Guaidó has returned. If Maduro doesn't have him arrested, they say, he could appear weak; if Maduro does arrest him, that could quell the opposition — or it could strengthen international condemnation and potentially provoke military action. "Any measure that could put at risk Juan Guaidó's freedom, safety or personal integrity would represent a major escalation of tensions and meet the firm condemnation of the international community," said EU foreign policy chief Federica Mogherini, according to The Associated Press. "The two of them are between a rock and a hard place," said former Venezuelan ambassador to the U.S. and former interior minister Ignacio Arcaya, who believes Maduro is likely to arrest Guaidó. "If he arrests him, the world pressure will pull him out of jail pretty soon," Colombian President Iván Duque told the Washington Post. "But if he decides to do something nasty, nobody inside of Venezuela would support him. It would be like Nero burning Rome." Russian politician Valentina Matviyenko told Venezuelan leadership that Russia is concerned the U.S. is looking for any kind of incitement "to provoke bloodshed" and to justify military intervention in Venezuela, according to Russian news service TASS. Russia backs Maduro's claim to the presidency. During an interview with RT, Venezuela Vice President Delcy Rodriguez would not rule out criminally prosecuting Guaidó upon his return to Venezuela. Plotting to topple the government is against the law, she said, and Venezuelan authorities "are already taking the necessary measures and will continue to protect our state of law and order."